Hey here's some finger puppets that Geoff and I put together sometime ago as promo pieces. Feel free to download this image...so you can print out and cut (within the dotted lines) the finger puppets. 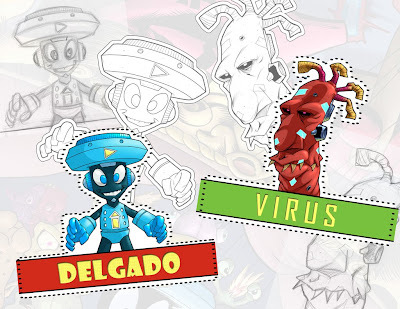 You'll have hours of enjoyment with these fine finger puppets of our hero Delgado and the nasty Virus. Well, I'll catch you all later!